Thursday Motorola Inc unveiled plans to split into two companies in the first quarter of 2011, separating its cellphone and television set-top box businesses from the rest of the company. Motorola shares rose 3.9 percent to $6.93 in extended trade after the news. The company had said last month that it planned to separate its handset business, which has been struggling to win back market share. But executives had also said they were looking at alternative structures. Motorola said the enterprise and network equipment business will be the entity responsible for Motorola's current public debt and will be capitalized to achieve an investment grade rating. 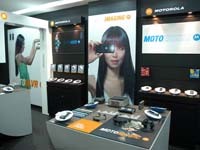 Motorola's latest financial results show its mobile phone business had revenue of $7 billion for 2009. The enterprise wireless business had revenue of $2 billion while home and network sales brought in another $2 billion.